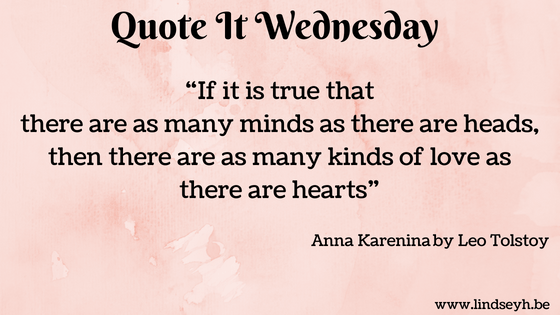 I’m kind of cheating a little bit with this week’s quote, since I have not actually read Anna Karenina myself yet. Nor have I seen the movie (though I definitely intend to). But I found this quote in another book, namely Tash Hearts Tolstoy by Kathryn Ormsbee. Since that is a story about a romantic asexual character, I thought this quote was really nice and fitting. And yes, I think society in general definitely needs to learn that there are different kinds of love, and there is not one right love. There is eros, sexual love, but also agape, unconditional love. There is philia, friendship which is also love. And many more kinds of love. Love is not limited to any kind of sexuality. Love can definitely even be inherently asexual. Love is love and love is unlimited. WHAT DO YOU THINK OF THIS QUOTE? Do you also believe that there are many kinds of love? I’ve never read this book either, but I LOVE the quote, and it’s so true. I definitely believe there all types of love – and they don’t have to be sexual at all. I really like this quote! I have read Anna Karenina, more than once – although it is super long and takes forever to read. I agree that there are many kinds of love, and it doesn’t always have to be romantic. It has been a long time since I’ve read this book but I do remember the quote and completely agree with it. I think there are many different kinds of love and that sometimes the nonsexual kinds can be even more meaningful than those that are more sexual in nature. It’s so cool that you read the book! Have you seen the movie too? If so, is it worth a watch?